Birthday Project 2012--What is a hauled water system...and why do we care? I wanted to share with you some information about the type of water systems that Project Pueblo (and us*) will be installing for the Navajo elders that I showed in the other thread. *By the way, the "and us" is why we should care! This paper presents the design of the temporary water systems that were developed and installed as part of the Black Falls Water Project. 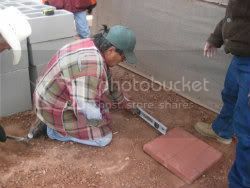 The project was a collaboration that began in July, 2008, between the US EPA and a coalition of families in the Black Falls region of the Navajo Nation. The coalition was organized and supported by Forgotten People CDC (FP CDC), a community organization based in Tuba City, AZ, with guidance from an academic partner, which was the Capacity Building Initiative at the Heller School for Social Policy, Brandeis University. The project was primarily funded from a grant from the EPA Environmental Justice Small Grants Program. 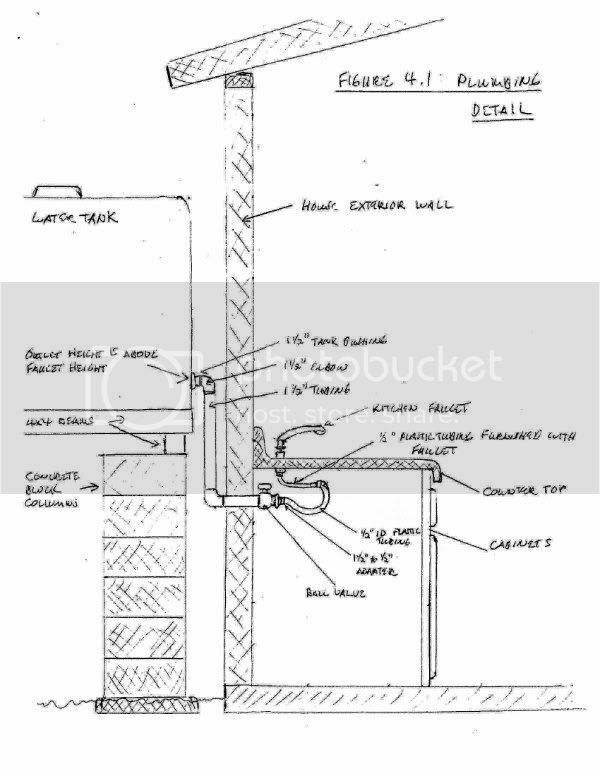 During the Black Falls water project, local residents designed and deployed a temporary water storage system using an elevated external water storage tank and kitchen sink. The tank provides high-capacity storage as needed to support efficient water delivery services and replaces the unsafe system of buckets currently in widespread use. The system can provide an immediate and low cost means to provide safe access to drinking water to a large population. Minimal training is needed to perform the on-site work, so that rapid up-scaling can be achieved using local labor. Deployment of the systems links the people into the provider network for health care, water delivery, and other related services. The system design is well suited for deployment via a community cooperative approach, which can reduce cost and improve sustainability. The long-term plan was to install solar-powered cisterns, after which the materials from the temporary external tanks could be reused at other locations. 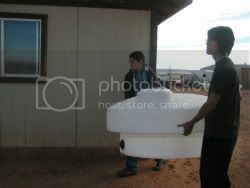 •	Support water delivery services: A large on-site tank reduces the cost of operating a delivery service, as fewer trips to each home are required. The recommended design for replication uses a 405 gallon tank, which can hold more than the monthly consumption of most of the families at Black Falls. •	Replaces unsafe storage systems: The system provides a closed storage and distribution system, which eliminates the bacterial and chemical contamination associated with the buckets and improvised containers. •	Fast installation with limited training: The system was designed for quick on-site installation. 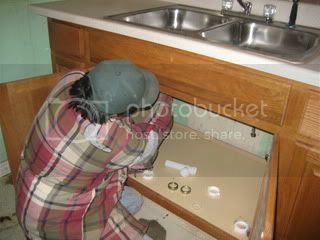 If a stockpile of parts and preassembled kitchen units is available, a house can be brought on line in a few hours. Minimal training is needed to perform the on-site work, so that rapid up-scaling can be achieved using local labor. •	Efficient replacement: When a family subsequently obtains a cistern or access to piped water, the storage system can be moved to another home, while the sink/counter can be used with the hot water and pressurized system with few adjustments. The last picture I have is a cross section drawing of the plan overview so you all can get an idea of what the system will look like, installed. I hope this helps to give you a clearer picture of the whole project! 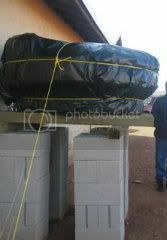 Re: Birthday Project 2012--What is a hauled water system...and why do we care? Thanks so much for all of the information you and PtP have shared for this project. It so enlightening to see how others have to live and then to see what can be done to help, both short and long-term. And to know how my money will be spent. You know, as I read through the birthday project threads this year, with every bit of new information I have been taken aback time and again. First came the shock when I learned of the Bennett Freeze. How could that possibly happen, and then how could it continue for 40 years!? (I didn’t believe it. Had to go Google it. Couldn't be true.) Then to learn of the extreme poverty and living conditions. How could that be? Right here at home? Not Africa. Not Central or South America. Right here. RIGHT HERE! Then to learn of the uranium and arsenic contamination. Courtesy of our government, thank you very much. Contaminated wells, health problems, water I wouldn’t even consider fit for my animals. All week I’ve been catching myself just staring at our water. Has anyone else had this experience? On Tuesday I went to make a pot of coffee. Filled up the pot, then remembered my husband wasn’t home so dumped half down the drain. Found myself staring at the drain. The next day we had filled up a 2 gallon thermos with nice cold water to have as we worked on a vegetable garden (part of my son’s Eagle scout project but that’s another story). We drank maybe half as we worked. The rest we brought home. It sat on the kitchen counter for a few hours, but eventually, yeah, I dumped it. But this time, boy was I thinking as I was dumping. I have a nice little patio off the kitchen. Lots of flowers. I’m pretty proud of that little patio too – it’s my little respite from the urban jungle. Generally, it makes me happy. But I have to say, watering the flowers the last couple of days really hasn’t been fun. What would Alice and Key, or Rena, or Pauline, or Caroline and Burt, or Alice Tso think of my frivolous waste? What would they give to have so much water they could just spray it around at will? And now, with this post I see the actual water system that we will be able to provide these families. So basic!! Another shock. Rudimentary, really. But so, so, so important. So completely necessary. So… I’m donating again. Thank you, Theresa. Thank you Part Time Poet. Thank you Zone for opening my eyes. And thank you to everyone who’s contributed. Oh, and hats off to Sean and everyone at Project Pueblo!! I've been feeling guilty watering my plants, too. But everything and everyone on this planet needs clean water to survive. I hope our birthday project not only raises money to help, but also raises awareness to the powers that be. Maybe during an election year, someone will actually take notice about what's important and do something when elected. Je vous souhaite un très bon anniversaire et bravo pour votre beau geste pour les indiens navajos, si tous les acteurs étaient comme vous, ce serait magnifique. Je vous embrasse. I wish you a very happy birthday and congratulations for your nice gesture for the Navajo Indians, if all players were like you, it would be wonderful. I embrace you. Last edited by Theresa on Sat Jun 09, 2012 10:56 am, edited 2 times in total. Reason: Please post in English. Thanks! Thanks for the great information, Theresa. I have a question. When they eventually run out of their 405 gallons of water, who replaces it? It sounds like a the water is delivered, but I'm confused as to who delivers and where exactly the water is brought from. Sorry, I just like to fill in the nooks and crannies in my brain. From what I understand in reading the information on their site, the water trucks are from the government (The EPA, I believe), because the area water has been identified as hazardous. That's how they get their water now, from government water tankers, but because they currently don't have the place to store large amounts, they have to go to a central location to fill up their containers. With the large tanks at their homes, the EPA will deliver the water to them--my guess is on a monthly basis. They won't go house to house without the tanks because of the remoteness of the area, the poor roads and cost involved in trying to deliver on a more frequent basis. Anyway, that's my understanding of the situation. RamblinRebel I understand what these people are living with. When I was growing up, an abandoned underground gasoline tank leaked and poluted the only source of water for a group of families in our neighborhood. The government brought in a tanker of water and for over a year, my father had to transport water from the tanker to our house 40 gallons at a time for our family of 6. You can't ever really know how much you depend on water until it is in very short supply. I remember dragging buckets of water from our bath water and from the laundry rinse water out to water our vegetable garden. I can feel for those people having to limit their water use to that extent and am so glad that we were able to raise enough to supply clean, safe, fresh water to 5 houses. Thanks for sharing your story--the only time I've had to haul water was when we were camping, and that was "vacation" and for a few days only. It's hard to imagine what these families have gone through. Remember that Project Pueblo will still be open for business even after the Birthday Project winds down, and your contributions will be very welcome there whenever you want to do more for the Navajo people. They are a small charity working with volunteer labor, so every donation is precious and is put to good use. Thanks Theresa. I have this thing about learning, so thank you for finding that answer. I need to make another trip to their site, as one question usually starts a flood of them. I have more questions that are maybe answered there. Questions like, how do they decide who gets a tank and who doesn't? Yes, shadowydog, thank you for sharing that. Difficult enough not having direct access to water; far more difficult, I imagine, when you have a family and children to care for as well! 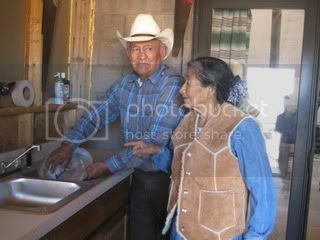 part-time poet wrote: Remember that Project Pueblo will still be open for business even after the Birthday Project winds down, and your contributions will be very welcome there whenever you want to do more for the Navajo people. They are a small charity working with volunteer labor, so every donation is precious and is put to good use. Excellent point and worth repeating!! Reading these stories has certainly opened my eyes, and I'm delighted to participate in the generous donation put together by the members of the the Zone. Let's make this an even more meaningful dedication to Johnny, and work hard to conserve water in our own homes and yards. It's an easy eco-conscious way to lessen our footprint, where-ever we live. We only have one Mother Earth, and we are only caretakers of the planet for our children and grandchildren.